This difficult-to-make light dates from an 1890 original Oxley Giddings, the deluxe manufacturer. The arms coming from the top of the light have decorative armbacks applied to each curve. A very unusual and attractive fixture illustrating the grace and inventiveness of the period. 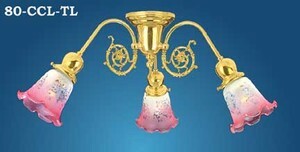 It is a "transitional" light, having both gaslight arms and early electric fittings - now fully electrified, of course. Shortest possible height of 28". Need this chandelier to be taller? Add our chandelier extension kit to increase the height. Wattage: 100 watts incandescent limit per socket. UL listed. Fixture uses 4" fitter shades on the "up" gas lights, and 2.25" fitter shades on the "down" electric lights. Shades are sold separately. We picture 053G and 054G as a suggestion, but offer other matching gas & electric shades from which to choose. We have many deLIGHTful fixtures to go with this fine chandelier. 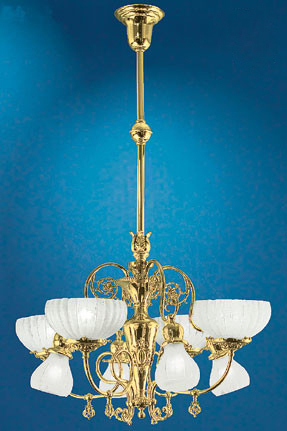 For lower ceilings, check out the Victorian 3-arm close ceiling chandelier. We also carry a wonderful newel post transitional light. 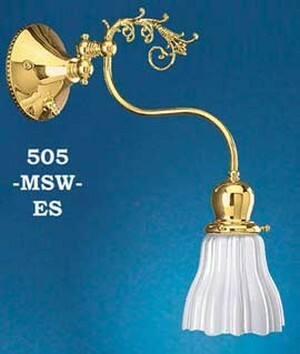 Did you know Victorians had wall-mounted reading lamps? Pictured here also is the single swivel sconce light. It's also available in a double-jointed swing arm model, too.